Happy Thursday everyone! It’s time for another Create with Connie and Mary Thursday challenge and this week we have a fun sketch for you! I am really liking this Starburst Sayings set. It’s fun by itself and also matched with the framelits. I know when I first saw it, I wasn’t too sure about it but I really am enjoying it now! I do have to say though…this is one of those cards that look SOOO much better in real life! Whisper White – 3 5/8 x 4 7/8. Stamp the starburst in Bermuda Bay and Real Red then the Celebrate in Basic Black. Layer on Basic Black 3 3/4 x 5 and add ot card front using dimensionals. Silver Foil – 1/4 x 3 5/8 and add to card front. Bermuda Bay – 3 1/8 x 3/4. 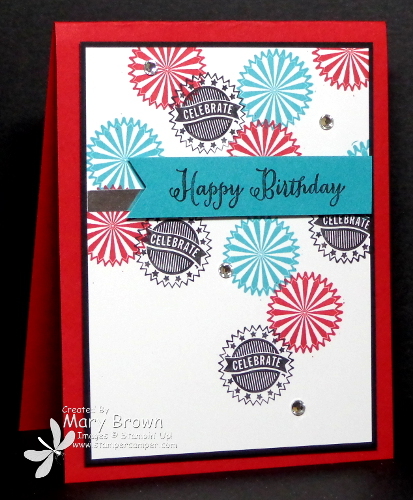 Stamp Happy Birthday in Basic Black, cut into a banner and add to card front using dimensionals. 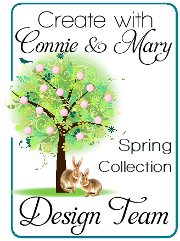 Create with Connie and Mary Spring Collection IS COMING!!! PREVIEW WEEK starts on Sunday and you can do the Early Bird special NOW for our Spring Collection 2014 on Create with Connie and Mary. This collection is all about the Occasions and Sale-A-Bration projects! We have lots of GREAT ideas to help you!! See more information over on Create with Connie and Mary!